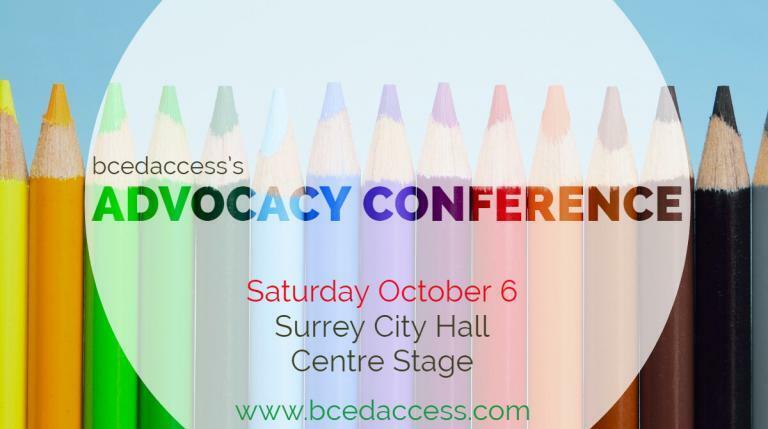 BCEdAccess is presenting our third annual advocacy conference – a full day of workshops for parents, guardians and allies of students with special needs. This year we will also be holding our first Annual General Meeting of our newly incorporated Society. Workshop topics and presenters will be announced soon – the theme this year is Strategies and Solutions, so expect practical information around students’ human rights and equitable access to education, mental health, a student self-advocate panel, and more! Lunch, coffee breaks and materials are included in the price, as well as Society membership for one year for all attendees. Specific separate meals for those with allergies cannot be accomodated this year. We plan to have a lunch that allows for appropriate choices for most food preferences and some allergies. Those with anaphylactic allergies or those who feel they need a more specific accommodation should contact the organizer for a no-lunch ticketing option, so that they can go to one of the many nearby eateries or bring their own. The venue is physically accessible. If you are attending and have specific accessibility needs of any kind, please inform us in advance so that we may provide any additional needed accommodations. Please contact the organizer with any questions or concerns about this event. This entry was posted on October 6, 2018 by Events Manager.